Hosted by the International Studio and Curatorial Program (ISCP) in New York, the idea is to offer the public ‘a place of respite during a time of “transition to a new global climate”, and in so doing ‘to create together content, experiences, everyday life... Coffee. Conspiracy. Community Chest’. 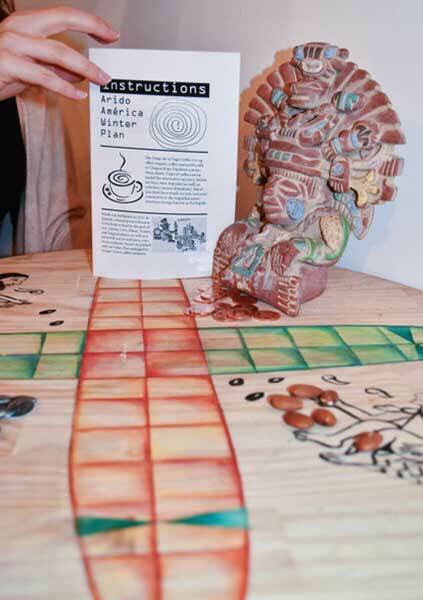 Pictures: Fran Ilich playing Patolli with visitors at El Museo de Los Sures founded by Southside United HDFC-Los Sures Executive Director Ramon Peguero, Aridoamérica Winter Plan, Offsite Project organized by the International Studio &Curatorial Program, December 2016.